EASY TO GRIP BOTTLE FOR LITTLE HANDS, with generous 2.5 ounce bottles. 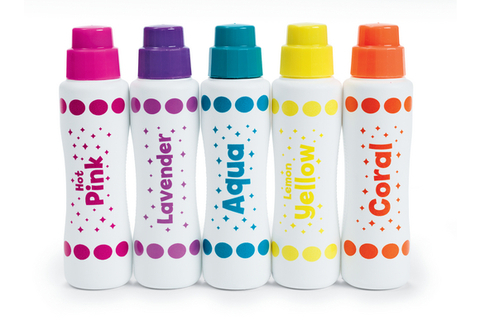 Do A Dot Art makers have more paint per bottle than other dot markers. Just twist off the cap and let the creativity begin. 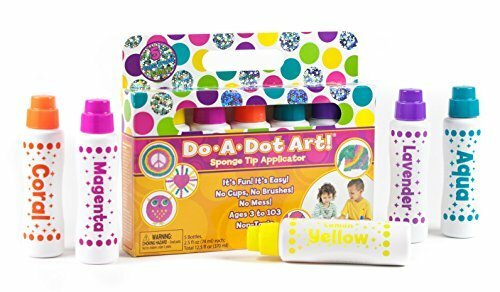 FUN ART MEDIUM FOR CHILDREN OF ALL AGES. Do A Dot Art markers have a PATENTED large sponge tip dauber engineered to be mess free, never dry out, and make a perfect dot every time. 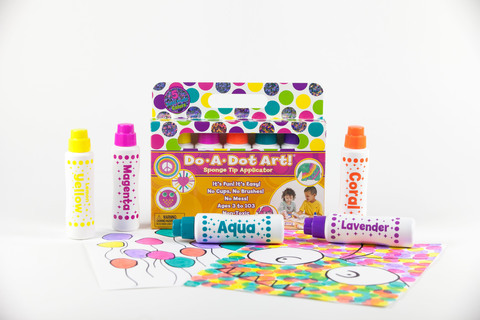 Kids love mixing, blending and layering colors to create their own masterpieces! MADE IN THE USA. Designed and manufactured in the factory in the USA guaranteeing that you are getting the best product without the risk of unknown and unwanted contaminants, and using only the highest quality materials and standards to ensure kids have endless fun, and parents and teachers have piece of mind. All Do A Dot Art markers are GLUTEN FREE and LATEX FREE.